The legendary 911 was built for racing in 2016 and production was exclusively limited; with Ravensburger 3D Puzzle® dreams of owning this engine have come to life with this authentic design. 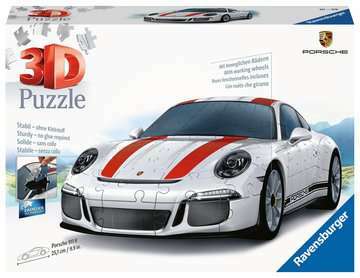 On a scale of 1:18, the Porsche 911 3D Puzzle® is the perfect miniature, with elegant lines and a classically white design appealing to any racing enthusiast. The 108 sturdy plastic puzzle pieces are individually shaped, partly bendable and fit perfectly together with Easyclick technology – no need for glue! An automotive experience that makes the pulse of motoring fanatics beat faster, the rotating wheels on this 3D Puzzle® add the final touch. With the help of the illustrated instructions, this sleek structure will be suitable for beginners or advanced puzzlers from the ages of 10 and up and will guarantee a sense of achievement and hours of puzzling fun. This puzzle uses unique plastic pieces, which slot together to build this sturdy and strong model. No glue required! Each puzzle piece is printed with a number on the reverse side, so you can either assemble the puzzle by eye, or just by following the numbers.